Hong Kong is an impressive modern city boasting a stunning skyline studded with skyscrapers and mountains as the backdrop. The city`s waterways, islands and bay`s provide visitors with plenty of adventures on land and water including ferry rides, beaches, theme parks, temples, parks, and peaks. A city filled with so much history and culture hidden down every little alleyway and up every green hilly mountain. 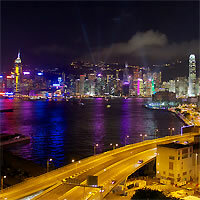 Discover what Hong Kong has to offer with Michelin-starred menu`s, traditional street markets and exclusive shopping. Victoria Peak, Lantau Island and Peak, Victoria Harbour, Ngong Ping 360, Po Lin Monastery, Man Mo Temple, Finance Centre, Ten Thousand Buddha`s Monastery, Hong Kong Museum of Art, Botanical Gardens, Statue Square, The Cenotaph, Old Supreme Court Building and so much more! 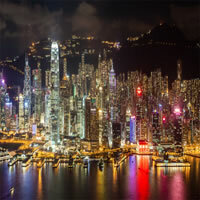 The vibrant city of Hong Kong is a floating metropolis featuring an iconic skyline filled with skyscrapers, in the most densely populated city in the world. A glamorous city with so much to offer in ways of world class cuisine, luxury shopping, ancient temples, beautiful beaches and traditional fishing villages, along with years of culture and history packed into the crowded streets. Enjoy great hikes along the coast, scope out the street markets, and head up to Victoria Peak. Browse the museums, dine on dim sum and cruise on the Star Ferry where you can witness the spectacular Symphony of Lights show. This diverse city is a food lover`s dream featuring 4 of the top 100 restaurants in the world and some of the best nightlife entertainment districts in Asia. Hong Kong and Tokyo Highlights! Explore Hong Kong, the place where East meets West! Western culture coexists seamlessly with traditional philosophy and practices of the Orient offering unique experiences to Hong Kong's tourists. 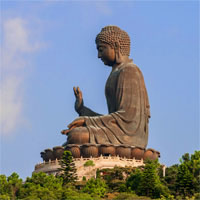 Visit one of the biggest attractions such as the world's tallest, bronze Buddha or you can move on to the Lantau Peak, and admire the view of the surrounding city skyline, the world-famous Victoria Harbor and Kowloon, towering skyscrapers and peaceful green hillsides. Up next fly into Tokyo, one of the largest cities in the world! Among the highlights of Tokyo not to be missed are: the Sony building in Ginza, the Imperial Palace, The Temples of Asakusa, Shinjuku Gyoen Park, Meiji Shrine, Korakuen Garden, sight of the sacred mountain of Fuji in early morning. Explore and enjoy Hong Kong and Beijing! Fly to Hong Kong, the place where East meets West! Western culture coexists seamlessly with traditional philosophy and practices of the Orient offering unique experiences to Hong Kong's tourists. Visit one of the biggest attractions, Hong Kong Disneyland or the world's tallest, bronze Buddha, you can move on to the Lantau Peak, and admire the view of the surrounding city skyline, the world-famous Victoria Harbor and Kowloon, towering skyscrapers and peaceful green hillsides. This city will make your jaw drop! Then fly into Beijing, this city offers an unparalleled delight to travelers as they explore its ancient past and enjoy its exciting modern development! Beijing has some of the most superb examples of Chinese architecture, the biggest central square in the world - Tian'anmen Square, the Forbidden City - the largest and best-preserved imperial palace complex, a superbly preserved section of the Great Wall, as well as the largest sacrificial complex in the world - the Temple of Heaven, are just few of the tourist attractions. Three Asia top destinations together! Explore Hong Kong, the place where East meets West! Western culture coexists seamlessly with traditional philosophy and practices of the Orient offering unique experiences to Hong Kong's tourists. Visit one of the biggest attractions, Hong Kong Disneyland or the world's tallest, bronze Buddha, you can move on to the Lantau Peak, and admire the view of the surrounding city skyline, the world-famous Victoria Harbor and Kowloon, towering skyscrapers and peaceful green hillsides! Then fly to Bangkok, land in the colorful, exotic and pleasingly city! Visit the impressive sacred temples and get amazed by the authentic experience of the pioneer floating markets. Last but not least, fly to Singapore, an ultra-modern city of soaring skyscrapers! Visit here Marina Bay Sands, an integrated resort with the world's most expensive casino fronting Marina Bay; Raffles Place, located in the Downtown Core and the Central Area, it features some of the tallest buildings and landmarks of the country. Explore and enjoy the best of Hong Kong and Macau! Fly to Hong Kong, the place where East meets West! Western culture coexists seamlessly with traditional philosophy and practices of the Orient offering unique experiences to Hong Kong's tourists. Visit one of the biggest attractions, Hong Kong Disneyland or the world's tallest, bronze Buddha, you can move on to the Lantau Peak, and admire the view of the surrounding city skyline, the world-famous Victoria Harbor and Kowloon, towering skyscrapers and peaceful green hillsides. Then fly into Macau, experience the night life style visiting casinos and amusing yourself with spectacular night city views! Here you can visit Guia Fortress, Macau Tower, Kun Iam Statue, A Ma Temple or Senado Square. Explore and enjoy the best of Hong Kong and Bali! Fly to Hong Kong, the place where East meets West! Western culture coexists seamlessly with traditional philosophy and practices of the Orient offering unique experiences to Hong Kong's tourists. Visit one of the biggest attractions, Hong Kong Disneyland or the world's tallest, bronze Buddha, you can move on to the Lantau Peak, and admire the view of the surrounding city skyline, the world-famous Victoria Harbor and Kowloon, towering skyscrapers and peaceful green hillsides. Then fly into Bali, relax in its beautiful beaches! The most beautiful ones are Legian, Amed, Nusa Dua and Sanur. Visit Bali Museum at Denpasar's Square, which exhibits a nice collection of carvings, paintings and costumes; go shopping or enjoy the Water Park and Spa! Discover two of Asia's most vibrant cities! Explore and visit Hong Kong, the place where East meets West! Western culture coexists seamlessly with traditional philosophy and practices of the Orient offering unique experiences to Hong Kong's tourists. Visit one of the biggest attractions, Hong Kong Disneyland or the world's tallest, bronze Buddha, you can move on to the Lantau Peak, and admire the view of the surrounding city skyline, the world-famous Victoria Harbor and Kowloon, towering skyscrapers and peaceful green hillsides. 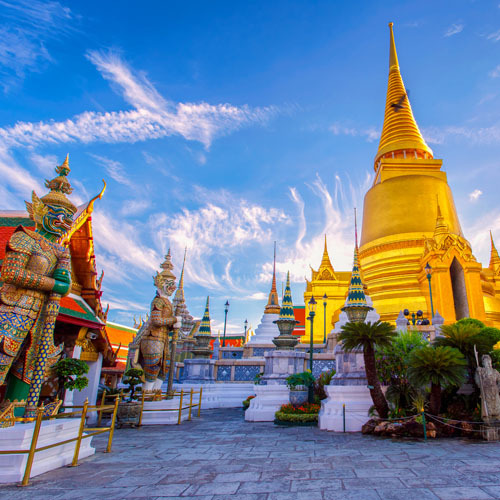 Up next fly into Bangkok, land in the colorful, exotic and pleasingly city! Visit the impressive sacred temples and get amazed by the authentic experience of the pioneer floating markets. Three top destinations to explore in Asia! Explore and visit Hong Kong, the place where East meets West! Western culture coexists seamlessly with traditional philosophy and practices of the Orient offering unique experiences to Hong Kong's tourists. Then fly into Taipei, a marvelous city that blends traditional and modern influences in a very hospitable environment! Surrounded by mountains, and having a subtropical climate. Take a walk to remember through the Butterfly Corridor which displays about 151 species of butterflies! Last but not least fly to Tokyo, one of the largest cities in the world! Among the highlights of Tokyo not to be missed are The Sony building in Ginza, the Imperial Palace, The Temples of Asakusa, Shinjuku Gyoen Park, Meiji Shrine, Korakuen Garden, sight of the sacred mountain of Fuji in early morning. Explore and enjoy the best of Hong Kong and Taipei! Explore and visit Hong Kong, the place where East meets West! Western culture coexists seamlessly with traditional philosophy and practices of the Orient offering unique experiences to Hong Kong's tourists. Visit one of the biggest attractions, Hong Kong Disneyland or the world's tallest, bronze Buddha, you can move on to the Lantau Peak, and admire the view of the surrounding city skyline, the world-famous Victoria Harbor and Kowloon, towering skyscrapers and peaceful green hillsides. 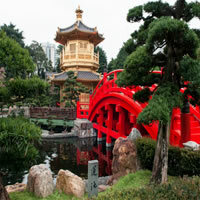 Then fly into Taipei, a marvelous city that blends traditional and modern influences in a very hospitable environment! Surrounded by mountains, and having a subtropical climate. The National Place Museum, Taipei Gallery, National Museum of History, and Miniatures Museum of Taiwan are just few of the places where you can experience the local culture. Take a walk to remember through the Butterfly Corridor which displays about 151 species of butterflies! Explore and enjoy the best of Hong Kong, Singapore and Kuala Lumpur! Fly to Hong Kong, the place where East meets West! Western culture coexists seamlessly with traditional philosophy and practices of the Orient offering unique experiences to Hong Kong's tourists. Visit one of the biggest attractions, Hong Kong Disneyland or the world's tallest, bronze Buddha, you can move on to the Lantau Peak, and admire the view of the surrounding city skyline, the world-famous Victoria Harbor and Kowloon, towering skyscrapers and peaceful green hillsides. Then fly into Singapore, an ultra-modern city of soaring skyscrapers! Visit here Marina Bay Sands, an integrated resort with the world's most expensive casino fronting Marina Bay; Raffles Place, located in the Downtown Core and the Central Area, it features some of the tallest buildings and landmarks of the country. Up next, fly to Kuala Lumpur, amuse yourself visiting beautiful palaces, temples,museums and towers! Explore Petronas Twin Towers, which are the world's tallest twin structures located in the city center. Discover Hong Kong and Siem Reap Highlights! Explore Hong Kong,the place where East meets West! Western culture coexists seamlessly with traditional philosophy and practices of the Orient offering unique experiences to Hong Kong's tourists. Visit one of the biggest attractions, Hong Kong Disneyland or the world's tallest, bronze Buddha, you can move on to the Lantau Peak, and admire the view of the surrounding city skyline, the world-famous Victoria Harbor and Kowloon, towering skyscrapers and peaceful green hillsides! Then fly to Siem Reap, a rich cultural city in Cambodia! Here you can delve into their alluring museums, ancient temples, and night markets. Explore and enjoy the best of Hong Kong, Shenzhen and Guangzhou! Explore and visit Hong Kong, the place where East meets West! Western culture coexists seamlessly with traditional philosophy and practices of the Orient offering unique experiences to Hong Kong's tourists. Visit one of the biggest attractions, Hong Kong Disneyland or the world's tallest, bronze Buddha, you can move on to the Lantau Peak, and admire the view of the surrounding city skyline, the world-famous Victoria Harbor and Kowloon, towering skyscrapers and peaceful green hillsides. Then fly into Shenzhen, a highly developed modern city! Visit three great theme parks, including China Folk Culture Village, Window of the World, and Happy Valley. You can as well visit Shenzhen Safari Park and Fairy Lake Botanical Garden, two places two spend half day exploring! Last but not least, fly to Guangzhou,a city with a lot to offer! Here visitors could chose between different destinations, such as, Pearl River, when evening light shows a blaze of neon lights will reflect on the river, presenting a fascinating night view; Sacred Heart Cathedral, the largest Roman Catholic church in the Gothic style; Baiyun Mountain, perfect place to escape the city with gorgeous natural scenery and abundant historical relics; Yuexiu Park, the largest park in downtown; Ancestral Temple of the Chen Family, academic and spiritual temple or Bright Filial Piety Temple, the oldest Buddhist temple in Guangzhou. Three Asia top destinations together! Explore Hong Kong, the place where East meets West! Western culture coexists seamlessly with traditional philosophy and practices of the Orient offering unique experiences to Hong Kong's tourists. Visit one of the biggest attractions, Hong Kong Disneyland or the world's tallest, bronze Buddha, you can move on to the Lantau Peak, and admire the view of the surrounding city skyline, the world-famous Victoria Harbor and Kowloon, towering skyscrapers and peaceful green hillsides! Then fly to Lijiang, famous old town for its system of waterways and bridges! Visitors can amuse themselves visiting different destinations that Lijiang has to offer, just to mention Old City of Lijiang, Lugu Lake, Jade Dragon Snow Mountain, Black Dragon Pool, Yufeng Temple or Mu Palace! Last but not least, fly into Shangai discover their enchanting traditions and heritage! Here you will find the perfect blend of tradition, culture and modernity. Visit The Bund, The Pearl Tower, Jade Buddha Temple and Pudong District, one of the most amazing places in China. Five amazing destinations just for you! The first one is Hong Kong, the place where East meets West! Western culture coexists seamlessly with traditional philosophy and practices of the Orient offering unique experiences to Hong Kong's tourists. 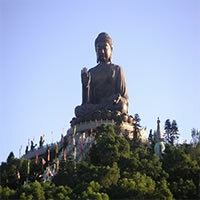 Visit one of the biggest attractions, Hong Kong Disneyland or the world's tallest, bronze Buddha. Then fly into Bangkok, land in the colorful, exotic and pleasingly city! Visit the impressive sacred temples and get amazed by the authentic experience of the pioneer floating markets. Up next, fly to Siem Reap, a rich cultural city in Cambodia! Here you can delve into their alluring museums, ancient temples, and night markets. Next destination is Phnom Penh, a city full of attractions and memorable places to visit! If you are in Phnom Penh, this next places are a must for you Royal Palace, Choeung Ek Genocidal Center, Tuol Sleng Genocide Museum, Silver Pagoda and Phnom Tamao Wildlife Rescue Center. Last but not least, fly to Krabi a city where you can visit different beaches and practice water sports! Practice scuba diving, snorkeling, kayaking, canoeing in this next beaches Khlong Muang Beach, Ao Nang Beach or Noppharathara Beach. Additional tours and activities can be added at extra cost. Explore and enjoy the best of Hong Kong, Chengdu and Beijing! Explore and visit Hong Kong, the place where East meets West! Western culture coexists seamlessly with traditional philosophy and practices of the Orient offering unique experiences to Hong Kong's tourists. Visit one of the biggest attractions, Hong Kong Disneyland or the world's tallest, bronze Buddha, you can move on to the Lantau Peak, and admire the view of the surrounding city skyline, the world-famous Victoria Harbor and Kowloon, towering skyscrapers and peaceful green hillsides. Then fly into Chengdu, famous city for its spicy cuisine! You will be able to visit Landscapes, Temples and Business buildings are characteristic of this booming city, as well as the rich cultural heritage. Do not miss visiting Mount Qincheng, which is a World Heritage site. It is a must to go to the famous Chengdu Research Base of Giant Panda Breeding, a conservation center where visitors can view endangered giant pandas in a natural habitat. Last but not least, enjoy a trip to Beijing, this city offers an unparalleled delight to travelers as they explore its ancient past and enjoy its exciting modern development! Beijing has some of the most superb examples of Chinese architecture, the biggest central square in the world - Tian'anmen Square, the Forbidden City - the largest and best-preserved imperial palace complex, The Temple of Heaven, are just few of the tourist attractions. I have used Tripmaster for my vacation needs for many years. Everything always went smoothly. Thank you. I had a wonderful time. Hotels and flights were all as expected. Totally satisfied with my experience.